In the last two decades, important new understanding of how the brain affects mental illness, addiction, and other psychosocial conditions has occurred. Social work education must integrate neuroscience into its curricula to prepare students for professional practice that reflects this knowledge. The last 20 years have produced technological advancements that have significantly affected social and behavioral science research. Our understanding of the human brain and biophysiological processes involved in behavior have shed light on the etiology, treatment, and prevention of mental illness, addiction, and other psychosocial conditions. The Decade of the Brain (1990 to 1999), an initiative between the Library of Congress and the National Institute of Mental Health to enhance public awareness of brain research benefits, and the advent of noninvasive neuroimaging and biofeedback technologies such as magnetic resonance imaging, positron emission tomography, and electroencephalography, have taken the helping professions to a new plane of understanding human psychiatric conditions. For several years, medical researchers have been conducting in vivo, real-time clinical research on human brain functioning. Previously, brain research was relegated exclusively to animal models and posthumous techniques. These newer technologies have provided insight into brain structure and function, how and why the brain works, what can go wrong, and how we can fix the resulting problems. While other allied professions, such as psychiatry and psychology, have embraced new directions in this understanding, social work has lagged behind. Several social work scholars and researchers at the forefront of this new wave of knowledge have attempted to pull the social work profession along with this tide of information. For example, Applegate and Shapiro published Neurobiology for Clinical Social Work in 2005; Farmer published Neuroscience and Social Work Practice: The Missing Link in 2009; and Matto and colleagues published Neuroscience for Social Work: Current Research and Practice in 2013. Nonetheless, the national discourse of the social work profession and college and university curricula is lacking in information about the human brain, how it works, and subsequent implications for the assessment, treatment, and prevention of clients’ psychosocial conditions. In 2002, Louis Cozolino, PhD, a clinical psychologist and professor of psychology at Pepperdine University, published The Neuroscience of Psychotherapy: Healing the Social Brain, a look at the neurobiological foundations of human behavior and the neuroscience behind why and how therapy works. Dan Siegel, MD, coedited a comprehensive work in 2003, Healing Trauma: Attachment, Mind, Body and Brain that outlined the neurobiological foundations of understanding and treating trauma. The Boy Who Was Raised as a Dog by Bruce Perry, MD, further delineated the depth and breadth of a neurobiological understanding of human behavior in the face of trauma. These scholars’ comprehensive and collective works have facilitated the development of a new interdisciplinary field of study: social neuroscience or interpersonal neurobiology, the science of applying neuroscience knowledge to social problems, behavioral phenomena, and the human condition in general with significant implications for mental health and well-being (Siegel & Solomon, 2003). Why should social work concern itself with neuroscience? Social work is not medicine, and social workers are not medical professionals, including neuroscientists. So why should our profession be concerned with integrating knowledge about the brain into social work practice, policy, research, and education? It’s not an issue of keeping up with our sister professions of psychology and psychiatry. It’s about a professional and ethical mandate to stay current with the research on evidence-based practices and to articulate that information in a way that makes sense to our clients. The human brain is responsible for all thoughts, feelings, and behaviors. It’s command central, mission control for the human experience. Since we work with clients to help change their thoughts, feelings, and behavior, it stands to reason that we should concern ourselves with brain structure and function. We need to know how the brain develops, what it does, what gets in the way of its ability to function optimally, and how to help it operate in the best way possible because, just like other organs, such as the heart or lungs, the brain can get sick. We need a model for brain-based social work practice. Interpersonal neurobiology has shed light on the clinical significance of attachment and the first three years of life (Perry & Szalavitz, 2006). There are implications for preventive, protective, and promotive factors in early childhood development and education that facilitate optimal neural development, which minimizes risk and promotes resiliency in children. Educational psychology and contemporary education have long embraced the principles of cognitive neuroscience and its applications for teaching and learning in the classroom environment. Therefore, social work should follow suit in policy advocacy and practices with families with young children. For example, we know from neuroscience research that consistent, responsive, emotionally attuned caregiving in the early years facilitates neural growth and development in the brain and provides young children with the neurological capacity to self-soothe (Perry & Szalavitz). This promotes emotional regulation and behavioral control, preventing symptoms of hyperactivity, impulsivity, and oppositional and aggressive behavior. There are more symptoms of disorders such as ADHD or oppositional defiant disorders in children with disrupted or dysregulated attachment schemas due to abuse, neglect, and other traumatic or stressful life events (Siegel & Solomon). Human behavior and social environment courses should discuss the neurological implications of attachment and the early caregiving environment. These courses should also explain how children possess neurological facial recognition capability in the brain’s right orbitofrontal cortex that, when stimulated by “good-enough” caregiving, develops into the ability to regulate emotions, delay gratification, and promote executive functioning in later periods of development. Additionally, courses should discuss mirror neurons in the development of empathy, how to facilitate neural growth in these areas, and how children with autism function differently in this part of the brain. Social work students should be aware that when a pregnant mother experiences high levels of stress and anxiety, the developing fetus is bathed in cortisol and adrenaline, resulting in an infant with an overly active sympathetic nervous system that makes him or her more likely to be a fussy baby (Egan, Combs-Orme, & Neely-Barnes, 2011). This increases stress in the caregiving environment, which in turn increases the likelihood of abuse and neglect, especially in young mothers with little social or family support. It also may lead to issues with anxiety and self-regulation later in childhood, making the child more susceptible to stress and the negative effects of traumatic events. Social work has addressed the significant social problem of child maltreatment for more than 100 years. Neuroscience principles provide insight and awareness into the biophysiological processes that underlie traumatic experiences for children and help us to understand the longitudinal effects of trauma, poverty, and stress across the life span (Perry & Szalavitz; Siegel & Solomon). Using these principles, we can begin to understand how survivors of abuse and neglect develop hyperaroused sympathetic nervous systems, part of the human fight/flight/freeze response. In addition to symptoms of PTSD, this can lead to a host of other physiological symptoms, such as hyperactivity, impulsivity, and problems with attention and focus, some of the primary symptoms necessary for an ADHD diagnosis. Child abuse survivors also experience long-term physical health consequences due to cortisol and adrenaline being pumped into their blood over time. In high doses and after extended exposure, cortisol becomes toxic and actually shrinks certain parts of the brain responsible for learning and memory. The same process occurs in domestic violence survivors and children who witness domestic violence. Neuroscience offers new strategies for increasing the efficiency and effectiveness of treatment for abused and neglected children. Additionally, interpersonal neurobiology illuminates how best to address and treat communities recovering from natural and man-made disasters. With droves of soldiers returning from the Iraq and Afghanistan wars, the need to understand, assess, and treat this population is paramount. The current VA administration is struggling to meet this need (Abramson, 2012). Neuroscience provides an enlightening platform from which to understand and treat veterans. Social workers can help by maximizing the effectiveness of evidence-based treatments through findings from clinical and translational neuroscience. They also can maximize outcomes for soldiers and their families and be more sensitive to the clinical nuances of their challenges. Increased cortisol levels due to sympathetic hyperactivity in soldiers with PTSD causes brain toxicity that impairs executive functioning, memory, emotional regulation, and behavioral control over time. The use of brain-sensitive interventions such as yoga and mindfulness training can help these soldiers calm their sympathetic hyperarousal, decrease cortisol toxicity, and regenerate activities in the parts of the brain that control behavior. The neuroscience of traumatic brain injury—in which parts of the brain are affected, what implications this has for human behavior, and how best to treat survivors—is critical for social workers who work with this population. 60 Minutes produced an episode two years ago documenting the recovery of Sen. Gabrielle Giffords after being shot in the head during an election rally in Arizona. It highlighted how her treatment staff used out-of-the-box interventions such as music therapy to help regrow neurons that facilitated her quick recovery. Neuroscience research has resulted in major strides in understanding addiction and how best to treat and prevent addictive disorders. The National Institute of Mental Health has pressed forward in a biological understanding of addiction and its neurobiological substrates. Biofeedback and other clinical measures have been reinforced through this research. Social workers can utilize knowledge from neuroscience to target and prevent addictive behaviors, and pharmacological interventions for addiction are more sophisticated than ever thanks to brain research. Social workers frequently find themselves employed in medical and rehabilitative settings. The past several years have seen a push toward social work practice in geriatric and palliative care. A functional understanding of the brain and the neurobiological substrates of human behavior especially is helpful when working with individuals with Alzheimer’s disease and other age-related cognitive impairments, brain injury, and seizure disorders. Neuroscience principles have advanced our understanding of sensorimotor and noninvasive, nonpharmacological treatments of dementia and traumatic brain injury that can regrow neurons, facilitating an increase in functioning, health, and overall well-being for this population (University of California, San Francisco, 2012). brain structure and function, how these areas are affected in this population, and which interventions are most likely to facilitate neurogenesis and neural plasticity in old age. There is a biological process behind putting yourself in someone else’s shoes and feeling what they feel. Neuroscience helps us understand why empathy can be so powerful and yet so dangerous. Research supports the hypothesis that the reason psychotherapy works is due to the quality of the therapeutic relationship (Norcross, 2011). The discovery of mirror neurons has helped us to understand empathy and the energetic transaction that occurs between the clinician and client (Applegate & Shapiro, 2005). We now know there is a neurological process that underlies connecting with someone and providing witness to his or her struggle and pain. Neuroscience helps us to understand some of the issues that have plagued social work for years. Knowledge of mirror neurons and a better understanding of the neurobiological foundations of empathy have shed light on why compassion fatigue occurs and how secondary traumatic stress affects social workers on a personal level. Neuroscience has illuminated targeted opportunities for prevention of these professional problems. The transfer of healing energy between two brains can backfire. If social workers don’t properly care for themselves over time, they actually begin to take on their clients’ pain, heartache, stress, and trauma (Applegate & Shapiro). Did you know that your agency has a brain? Your practice setting literally functions in a way similarly to that of the human brain: complex, confusing, and painstakingly intricate. Part of the integration of neuroscience into the helping professions involves an earnest look at neurobiological principles of organizational operations and effectiveness. The corporate world has relied on these principles for years. It’s why companies such as Google, Apple, and Windows have incredibly high rates of employee satisfaction and retention, and very low rates of turnover (Crowley, 2013). Have you ever thought “Why does nothing ever get done around here? Why do we have meetings about meetings?” As organizations and agencies, we demonstrate an inability to change, learn, and grow, yet we send our workers out into communities and people’s homes and expect them to change that same behavior. There is a neurological basis for behavior in organizations. There is a neurobiological process underlying leadership that helps explain how we lead, grow, learn, develop, and treat one another in agency settings and how we change. This concept of “neuroleadership” (Ellington & McFadden, 2013) has profound implications for agency directors and administrators. How would you like to improve organizational effectiveness, employee performance, and client outcomes all while promoting worker commitment and loyalty and preventing burnout and turnover? Neuroscience literature can help provide some answers. Neuroscience provides significant implications for systems of care that serve children and families. Child welfare, mental health, education, and criminal justice systems of care could benefit, at both the micro and macro levels, from an incorporation of neuroscientific principles into all aspects of service programming, from clinical services to program policies to employee relations. Isn’t social work about change? How can social workers expect behavioral change in our clients and yet, as a profession, resist some new and uncharted territories? I remember a time when schools of social work resisted Blackboard technologies, online and blended learning formats, nontraditional forms of education, and student interaction. 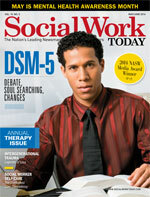 Now, according to the Council on Social Work Education, there are more than 25 MSW programs offered completely online. The answer lies in one word: evidence. It’s difficult for me to admit that, in my experience, shifts and changes in social work policy, education, and research historically have followed one trend: funding streams. We can no longer afford to devote our efforts into only those areas for which the government will pay us. We must ride the tidal wave of evidence along with other allied health professions and begin looking at what works and why. No place is this more relevant than social work education. It’s not only critical that we graduate social work students with a functional knowledge of the human brain and how to apply those principles to practice, but we also must apply the same knowledge in the university setting. A quick review of the relevant literature on adult education and cognitive neuroscience reveals that much classroom methodology may be arcane and outdated (Yang, 2004). Why are we not incorporating sensorimotor approaches to learning and behavior in the classroom? Isn’t the purpose of education to influence ideas and behaviors and to teach students to do something different or new? Let’s maximize our efforts and allow neuroscience to help us in this process. Having taught both in schools of social work and medical schools, I believe that problem-based learning approaches are superior to traditional didactic approaches to teaching and learning. And there’s neuroscience behind that, too. I can say anecdotally that when social work students are exposed to neuroscience knowledge, most are fascinated, invigorated, excited, and always want to learn more. Is neuroscience a panacea? A magic bullet to solve all of our problems? Of course not. I do agree with some scholars that an oversimplification of the brain and its associated functions can be dangerous. But as a social work practitioner and educator, I am constantly forced to be flexible, adaptive, and creative based on science, evidence, and experience. Social and clinical problems are evolving and becoming more complex every day. The environment in which we treat these problems has become more difficult, too. My journey toward understanding the neurological bases of human development and behavior has been exciting, uplifting, freeing, and rewarding. So many opportunities exist for interdisciplinary collaboration and transdisciplinary research in the areas of developmental, clinical, and translational neuroscience that I believe it almost unethical and irresponsible that the social work profession has not made a concerted effort to take advantage of advances in modern technology to maximize the effectiveness of interventions we provide to promote health, wellness, and healing for our clients. It’s a lot to learn, and it’s scary, but it begins with a first step. I recommend opening yourselves to the possibilities that exist. Be willing to journey into uncharted territory and make a commitment to continuing education, professional development, and lifelong learning for you, your clients, and your profession. — Nicholas Rutledge, MSW, LCSW, is a social worker for the division of child development and behavioral pediatrics and an instructor in the School of Health Related Professions at the University of Mississippi Medical Center in Jackson. Abramson, L. (2012, April 25). VA struggles to provide vets with mental health care. Retrieved from http://www.npr.org/2012/04/25/151319599/va-struggles-to-provide-vets-with-mental-health-care. Applegate, J. S., & Shapiro, J. R. (2005). Neurobiology for clinical social work. New York: W.W. Norton & Co.
Crowley, M. L. (2013). Not a happy accident: How Google designs workplace satisfaction. Retrieved from http://www.fastcompany.com/3007268/where-are-they-now/not-happy-accident-how-google-deliberately-designs-workplace-satisfaction. Egan, M., Combs-Orme, T., & Neely-Barnes, S. L. (2011). Integrating neuroscience knowledge into social work education: A case-based approach. Journal of Social Work Education, 47(2), 269-282. Ellington, L., & McFadden P. (2013, July 2). The neuroscience of leading change by creating new habits. Retrieved from http://www.neuroleader.us/2013/07/02/how-to-lead-change-by-creating-new-habits. Norcross, J. C. (Ed.). (2011). Psychotherapy relationships that work (2nd ed.). New York: Oxford University Press. Perry, B. D., & Szalavitz, M. (2006). The boy who was raised as a dog. New York: Perseus Books Group. Siegel, D. J., & Solomon, M. (2003). Healing trauma: Attachment, mind, body and brain. New York: W.W. Norton & Co.
University of California, San Francisco. (2012, February 29). Treating neurological disorders with music therapy. Retrieved from http://www.ucsf.edu/news/2012/02/11600/treating-neurological-disorders-music-therapy. Yang, B. (2004). A critical evaluation of adult learning theories and implications for human resource development. Retrieved from http://files.eric.ed.gov/fulltext/ED492 439.pdf.